Slow starts transformed into disappointing journeys for the San Diego Chargers and Minnesota Vikings in 2010. Both squads would like to prevent that from occurring again, but only one club will innate 2011 with a strong start. Philip Rivers and the Chargers will try to display they’re back among the NFL’s premiere and disrupt Donovan McNabb’s Vikings debut Sunday at Qualcomm Stadium. San Diego and Minnesota failed to triumph 2-5 beginnings last season, and eventually watched the playoffs from home after heading their respective divisions in 2009. The Chargers won seven of their final nine contests but a 9-7 result was a big letdown for a team coming off four consecutive AFC West crowns. Sluggish starts are nothing rare for Norv Turner’s unit, which began 2-3 in 2009 and 2008 and 1-3 in 2007 in his first run in San Diego. Rivers is compelled to change that, and is coming off one of his top performances. He had a career-best 4,710 passing yards with 30 touchdowns and 13 interceptions and a 101.8 passer rating, paving the Bolts to the NFL’s No. 1 ranked offense. “Ultimately, I think you’re measured by winning football games and we’ve won a lot of games, but we’ve fallen short,” Rivers said. “That’s the ultimate goal here is to lead this team to a championship. One location San Diego eyed for improvement is limiting turnovers after yielding 29 last season. The Chargers coughed up a league-low 76 over the previous four years. The Vikings went 6-10 last season, and had their own concerns with the rock, surrendering it over 37 times to tie for second-most in the NFC while more than doubling their amount from the previous season. That included 19 picks from the legendary Brett Favre, who finally retired after two years in the Twin Cities. 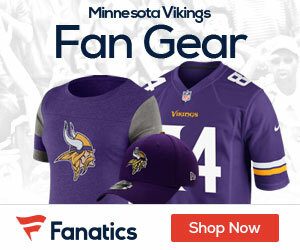 “I think the next level for us is just restoring what we had here in 2009, that confidence and swagger that we can get back to the playoffs,” said linebacker Chad Greenway, who led the NFC with 143 tackles. Part of that responsibility will drop on McNabb, who replaces Favre and is targeting redemption after a rocky season in the Nation’s Capital. He lost his starting gig with the Redskins late in the season after tossing 14 scores and a career-high 15 interceptions. Leslie Frazier, who was awarded Vikings coach in the offseason after an interim stint, is wowed by Donovan’s leadership skills. “He’s been great with his teammates,” Frazier said. “He’s done a great job picking up a new offense, and really improved all throughout the preseason. His interaction with his teammates has been great for our team chemistry, which is one of the reasons I feel good about our football team. Unlike in Washington, McNabb has some dynamic offensive weapons in his arsenal; featuring superstar running back Adrian Peterson and dazzling wide receiver Percy Harvin. Over the past four seasons, Peterson’s heads the NFL with 5,782 rushing yards and 52 touchdowns. He piled 1,298 yards and 12 scores last year, but was much improved with just one fumble after totaling 20 over his first three seasons. Adrian set a league record with 296 yards on 30 attempts, spearheading the Vikings to a 35-17 victory in the most recent gathering with the Chargers on November 4, 2007. Percy hauled in 71 receptions for 868 yards with five touchdowns in his second NFL season. The Chargers, meanwhile, pray to have a full campaign with elite targets Antonio Gates and Vincent Jackson. Gates led San Diego with 10 receiving touchdowns while amassing 782 yards on 50 catches, but missed six contests with a foot injury. Jackson was limited to five games due to a contract fight and calf injury. He had 248 yards and 14 receptions with three touchdowns – all generated in a Week 15 mismatch against San Francisco. While the offense is looking to stay atop the NFL’s prominent class, so is the defense after scooping up experience with linebackers Na’il Diggs and Takeo Spikes. “The biggest concern we have at the linebacker position is our youth,” Turner told the team’s official website. The Chargers and Vikings have split 10 meetings with San Diego taking the most recent battle at Qualcomm Stadium on November 9, 2003.
hey calvkg,go rubba bubas,go rubba bubbas splish splash splosh!!!!!!!!! I can see the Vikes being held to 16, sure. But I don’t really see the Chargers putting up 31 against this D, even without KWill. WELL THE SEASON FINALLY GOT HERE ! Thigpen would have been a disaster. He’s been terrible with Bill in pre-season. Terrible, as in Tim Couch terrible. 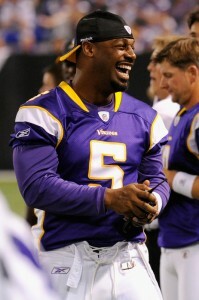 If McNabb is allowed to run the playbook Vike should be able to move the ball. Charger, at home, is a tough test. It would surprise me if Jenkins and Berrian caught half a dozen passes between them. We’re gonna win the damn game! The turning point was when they put Toby in instead of Peterson. They should have stuck with Peterson and Harvin. Instead, they were like, what else do we have? Then that wild cat series, wrong place, wrong time. I think this ones on the OC, otherwise we DO win the damn game, instead of starting in 4th place. The defense had some good plays, I’m pissed. Good morning my Purple brethren! Game day is finally here. Im hoping Vikes get the ball first, have about a 7 minute drive that ends with AP celebrating his new contract with a TD. Then a 3 and out with a sack from J.Allen. Yeah, running the ball, controlling the clock, pressure on Rivers. And most of all win the turnover battle, those are the keys. This morning, We chose to watch the 9/11 coverage on TV rather than go to church. Before we get stoked for football, I would just like to say a prayer for all the families of the victims that day in NYC, Pennsylvania and at the Pentagon. We would also like to pay special thanks and give a tribute to our brave service personnel who have lost their lives these last 10 years. We also send continued prayers to our current armed forces and wish them God’s Speed as they continue to keep us safe and ensure that the USA is the finest country on the planet. Because of all of them, we will be able to enjoy football today and for the rest of the year, in a peaceful, free country. So before we Show Our Horns, please take a moment of silent relfection. Thanks! God bless of you–and the United States of America! I’d watch with the cut pasting of articles man. Could bring trouble. Glad to see the Blazers won again VSU. Did you put that curse on? Is there gonna be a live-chat today? Think I’m going to have to order NFL RedZone coverage. A bit frenetic but gives you peak at all the games.